Over the weekend, an Oregon couple, their seven-month-old baby and small dog found themselves trapped in a bedroom while the family's cat -- a 22-pound Himalayan -- grew increasingly violent on the other side of the door. Things initially got out of hand when the cat scratched the infant's face, prompting one of the parents, Lee Palmer, to retaliate by kicking the feline in the rear. The cat then lashed out so fiercely that Palmer called 911, reporting that their pet had a history of violence. Eventually, a team of emergency responders was able to calm the cat down, and each member of the family -- pets included -- went to bed safely that night. While it's not very common for house cats to become so aggressive that humans feel the need to call 911, felines are known to lash out at their owners with some regularity -- usually in response to interspecies miscommunication that rubs both sides the wrong way. According to Jackson Galaxy, host of the television show "My Cat From Hell," cats often have violent responses to overstimulation, displaying what he calls "petting-related aggression." "In the case of overstimulation or petting-induced aggression, there are many theories," Galaxy reports at Little Big Cat. "[One is] a theory of physiological response: slow- and fast-acting touch receptors get their signals crossed, essentially turning the [cat's] initial feeling of pleasure to pain." 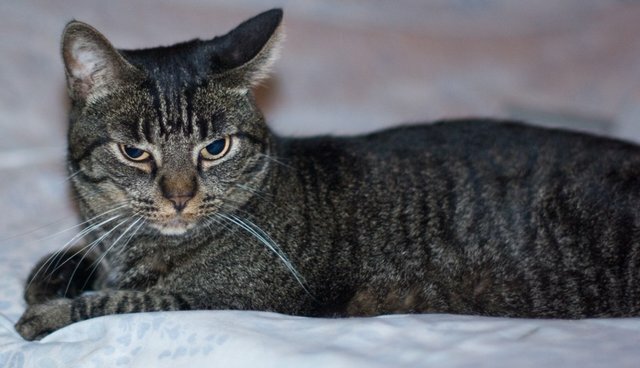 This feeling can cause the cat to respond impulsively by hissing, swatting, scratching or even biting the person -- now perceived as an attacker -- who's doing the petting. Sometimes, the cat might stay in this heightened state of arousal, remaining on edge even after the "threat" has passed. "Even if it's not overstimulation, it's a good departure point for talking about aggressive behavior like this," Galaxy told The Dodo. "Cats have a sympathetic nervous system, which is to say that when they are overstimulated -- they're in the red zone -- they don't make choices anymore. Their body makes choices for them. They're prey animals, so when they encounter threats, their fight or flight response kicks in. If that is triggered, in that moment they are just an animal trying to stay alive." But impulsive or reflexive responses aren't the only explanations for feline aggression; given the reported history of violence on the part of the outraged Himalayan in Oregon, it might not have been what caused him to become so violent on Sunday night. "Where a cat came from and how well socialized it was as a kitten are factors that often influence a cat's behavior," said Stephen Zawistowski, science advisor at the ASPCA. "[But] cats may show aggression for a variety of reasons. Sometimes cats will show redirected aggression." Zawistowski says this is especially true if there are other cats outside in the neighborhood; indoor cats are prone to anxiety, and when they're aroused they could attack anything -- or anyone -- in the vicinity. "This might also happen if other activities have aroused the cat, such as rough play or some type of commotion in the house," he explained. "For some cats, this might be a baby screaming and crying, and the parents' reaction to the baby." But inevitably, Zawistowski says, reacting poorly to the cat's backlash -- even if it doesn't seem warranted -- will likely make the situation worse. "Kicking the cat or yelling and screaming could escalate the situation, as it may feed into the cat's level of arousal," he said. "If a cat becomes aggressive or hostile, one option is to throw a blanket or towel over the cat. You can bundle up the cat and hold it until it calms, while staying safe from claws and teeth." But if that fails, you still shouldn't kick or spank the cat. You might, however, consider shutting the door to your bedroom, though it's unlikely you'll have to call 911.